It’s turning out to be one of the great pleasures of The Tonight Show Starring Jimmy Fallon. 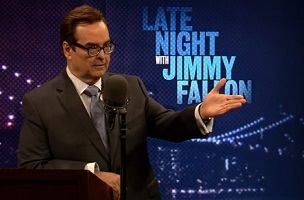 The insertion by Fallon into most every monologue of a recurring comedic-character impression. These imaginary friends are used as a punchline for subsequent monologue gags and also riffed on with deft expertise from the lectern by announcer Steve Higgins. 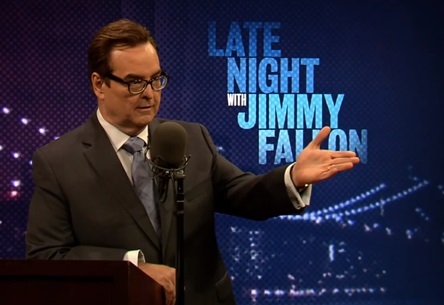 During one recent monologue for example, Fallon and Higgins triangulated around a big box electronics store wise guy. The sort of salesman who is aghast at anyone opting for medium-size flat screens, lower-end cable TV trappings and who reminds throughout his sales pitch that he’s got that Frozen sing-along Disney smash “right here!” On another occasion, Fallon and Higgins had tons of monologue fun with the idea of some cuckolded senior citizens reported to have left a measly seven-cent tip for their restaurant server. Sometimes, the monologue “third man” is famous, like Vladimir Putin. In each monologue case, the wonderful rapport of Fallon and Higgins and the playful tone of their shared imitation helps cement the phantom sidekicks deal.